This country-style rental villa is in a perfect location to enjoy Bulgaria beach resorts, seaside and culture-spots during the day, then come home to a spacious, modern property in a traditional village close to Varna. The house especially suits groups with one couple requiring extra privacy as in addition to the two-bedroom main house there is a seperate additional one-bedroom guest house with its own bathroom. The village is only 20 minutes drive from Varna, yet Voditsa is an extremely tranquil place surrounded by wheat, corn and sunflower fields, which are quite dazzling in the summer. The countryside provides an excellent base for those wishing to experience the incredible varient of flora and fauna here, or to spend a lazy afternoon at the local fishing lake. Voditsa is approximately 10 miles from Varna airport (not under a flight-path) and 13 miles from Varna City. Albena and Golden Sands are an easy drive of around 22 miles. With its own enclosed garden including a paved summer kitchen and barbeque area, you wont want to spend much time indoors. However, indoors at your disposal is a living room with large fire place, excellent modern fully fitted kitchen (including fridge-freezer, dishwasher, oven, hob and washing machine), and within the kitchen is a dining area. 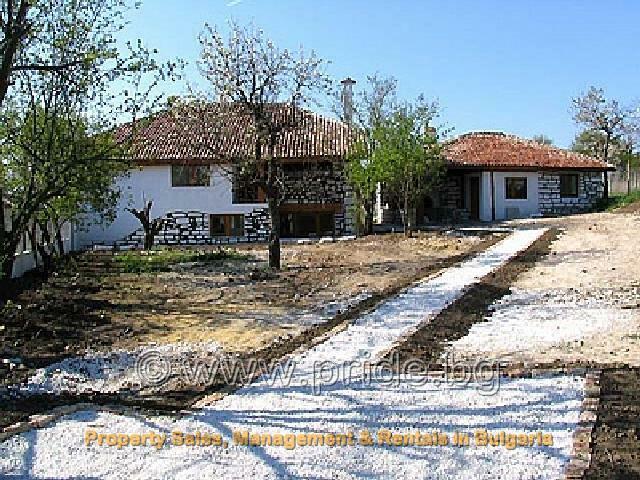 There are local bus services to the village, and taxis are also available, but as with all village rental villas in Bulgaria, we would recommend that you rent a car for this property and will arrange this for you without charging any commission. Remember with Pride Rentals, we offer all our rental villas and rental apartments, free advance bookings, Airport transfers, Guest registration, local information brochure and 24 hour emergency assistance. Special discounts are available on this property for stays of 10 days or more.